Over the recent Australia Day long weekend an old school friend, her husband and their four children came to visit me and stay overnight for one night. I’m lucky that I’ve got a three bedroom house and I was able to fit them all in. They would have stayed elsewhere if I couldn’t accommodate them but I wanted to so we could all kick back and not have to worry about anyone driving after a few drinks. Having a family of six people here, with kids ranging in ages from 16 down to 10 who all have healthy appetites made me realise just how much this many people can eat. We cooked a barbeque – they’d won a meat tray which helped out there – and as we were about to sit down and eat my friend asked if I had any bread. I’d completely forgotten to bring it out. The loaf of bread was demolished in that one meal. 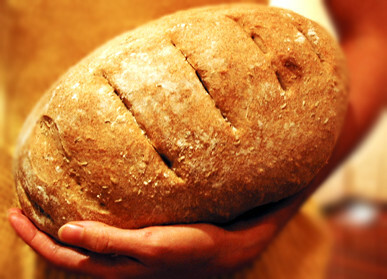 A loaf of bread normally lasts us one week and they told me they go through at least one a day. I guess their grocery budget is about five times ours, although JJ has a very healthy appetite and once he hits his teenage years and doesn’t go to after school care anymore, one loaf of bread a week just won’t be enough here either. But I’m in awe of families with more than two children. Shopping once a week wouldn’t be enough unless you had a huge amount of fridge and freezer space. And seeing three teenage boys spread out on my lounge just made my lounge room seem a lot smaller than it actually is. So how do people with large families do it? A couple of bloggers below show us. Nicole at Planning with Kids has just had her fifth baby and she’s apologising for only doing three to four blog posts per week over the next few months until she adjusts to the new addition. No wonder she writes a blog about planning with kids. You have to be organised as a parent anyway, let alone a parent with five children. She has plenty of menu planning tips and I know through my experience that planning what food you buy on a weekly basis helps save money rather than buying food on an ad-hoc basis. The Happy Housewife has a husband and six children, nearly seven, and they live on one income which is what she writes about on her blog. And she homeschools! Just like I’m in awe of people with lots of kids, I’m in awe of people who homeschool. Not that I want either of those things mind you. So, how many loaves of bread do you buy each week? We do 2 loaves of bread a week – 3-4 if V is working. When it was just ‘Salina and I, 1 loaf was more than ample. Boo and I probably use half a loaf each week!